Beside being Russia’s best-known and busiest city, Moscow is also famous for its exceptional literary heritage. Such giants of Russian literature as Pushkin, Chekhov, Gorky, and Esenin lived and worked in Russia’s capital. Here are Moscow’s most interesting literary places, where you can view the city through the eyes of celebrated authors. This place is irrevocably connected with the most mysterious novel in Russian literature: The Master and Margarita by Mikhail Bulgakov. It is believed that the bench opposite the house number 32 is the one where poet Ivan Bezdomny and ill-fated Berlioz encountered the devil himself. Take a stroll along the pond to see the tongue-in-cheek sign, advising to avoid talking to strangers, stop at Cafe Margarita, decorated with illustrations from the novel, and, if you’re up for a longer walk, visit Bulgakov’s museum on Bolshaya Sadovaya – where you can see that very “bad apartment”. Located opposite the Tretyakov gallery in Lavrushinsky Lane, this house was built between 1935 and 1937 to accommodate the ‘Soviet literary elite’. It is believed that writer Maxim Gorky came up with the idea of a separate apartment complex for the literary community and presented it to Joseph Stalin. The latter considered it viable enough to commission the house. Among the residents of this grey Stalinist building were poet Agniya Barto, writer Mikhail Prishvin, Konstantin Paustovsky, novelist Yury Olesha and Boris Pasternak – the latter created here his Nobel prize-winning Doctor Zhivago. Formerly known as Gendrikov Lane, in 1935 the side-street not far from Taganskaya Metro station was renamed after the most famous resident of the building № 13/15 – Vladimir Mayakovsky. In 1926 the celebrated poet moved into a tiny room in a communal apartment, which would soon become an ‘office’ of the LEF magazine and one of the most important literary places in Moscow. Short for the Left Front of Arts, the magazine hosted regular gatherings, which were frequented by poet Boris Pasternak and director Sergei Eisenstein. 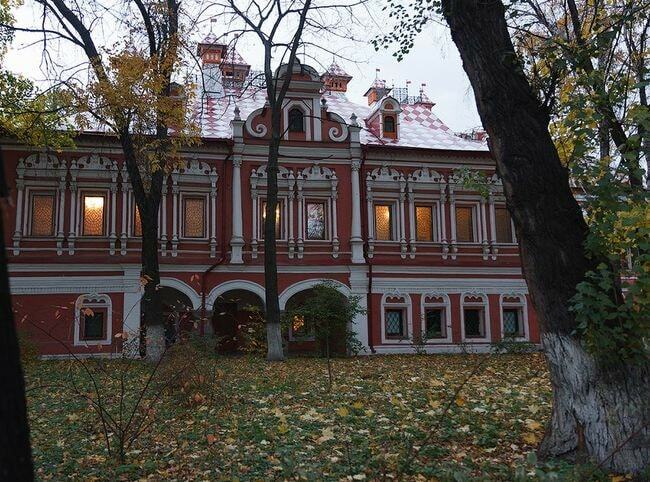 Located in the historic district of Khamovniki, the Leo Tolstoy Museum is housed in a classic Moscow estate. The famed writer acquired the estate in 1882 and spent his winters here until 1901. It’s in this house that he wrote The Death of Ivan Ilyich, Resurrection, and The Kreutzer Sonata, along with more than ninety other works. This blue fairytale house is all that’s left of a once spacious estate, which used to belong to Russian writer and historian Mikhail Pogodin. One of the few wooden constructions to survive the great fire of 1812, Pogodin’s house played host to various literary events and saw celebrated writers, playwrights and literary critics like Aleksandr Ostrovsky and Aksakov brothers. Mikhail Pogodin was friends with Nikolai Gogol, who stayed in this house multiple times. At Pogodin’s literary salon in 1841 Gogol read his just-finished first part of The Dead Souls. One of Moscow’s most famous streets is a cornucopia of literary places. Here, in Arbat’s oldest building, house № 53 was where poet Alexander Pushkin and his young wife Natalia Goncharova lived after the wedding – you’ll easily recognize the building by the monument to Russia’s favorite poet and his beloved. If you’re a fan of poet Marina Tsvetaeva, you should also stop by – she also was a resident, only several decades later. Building №9 was home to a famous literary cafe in 1920s; poets Sergey Esenin and Vladimir Mayakovsky were among the regulars. Famous Russian poet and singer-songwriter Bulat Okudzhava lived in house № 43 – his monument is one of the major attractions in Arbat. One of Moscow’s oldest buildings, the beautiful palace was allegedly built by Barma and Posnik, who, as legend has it, created the St. Basil’s Cathedral. This place is one of the so-called ‘Pushkin’s places’ in Moscow – the poet’s family partially rented the house from 1801 until 1803. While Alexander Pushkin was just a baby at the time, those early memories still found their way into his works. In this garden the poet saw a mechanical cat, that would later appear in Ruslan and Ludmila. The house is also thought to be the one that Tatiana from Eugene Onegin visited in Moscow.